I don’t know about you, but it’s already March and some of my NYE resolutions haven’t really taken off. Like reducing my yarn stash. Or fitting back into my old jeans. Or decluttering. Decluttering! It’s amazing how much stuff we collect over the years. I’ve been feeling quite heavy (not literally.. ok maybe a little bit) with things in the last few months. I was originally planning to get rid of at least one possession every day of the year. That makes 365 things in a year. Sounds great, doesn’t it? But as things go, I commute between two countries, I have two households, I have a lot of stuff, but not necessarily all in one place. So the decluttering doesn’t always happen when and where I’d like it to happen. I’m spending 2 consecutive weeks in the same house this month, so last week saw me frantically rooting through my wardrobes, drawers, boxes, tins – you name it, I’ve probably got something stored in it. I don’t like throwing perfectly good clothes (jewellery, household items) away, I’d rather swap or resell them, or give them to charity. Time for a trip to the flea market! Previous trips to markets and car boot sales have taught me that chaos is not good. Jumble is not good. Nobody will be interested in your things if your stall is one big mess. So this year, I’m being super organised. I’m taking tables to display all the little items, clothes racks for all the stuff I don’t wear anymore.. but what to do with the jewellery? I could buy a jewellery display. But wait, the whole idea was to get rid of things, not buy more things! So I came up with a quick and simple solution: A cardboard display that can be discarded (you can of course keep it and reuse it later). I had all the materials at home so it cost me literally nothing apart from a little time. 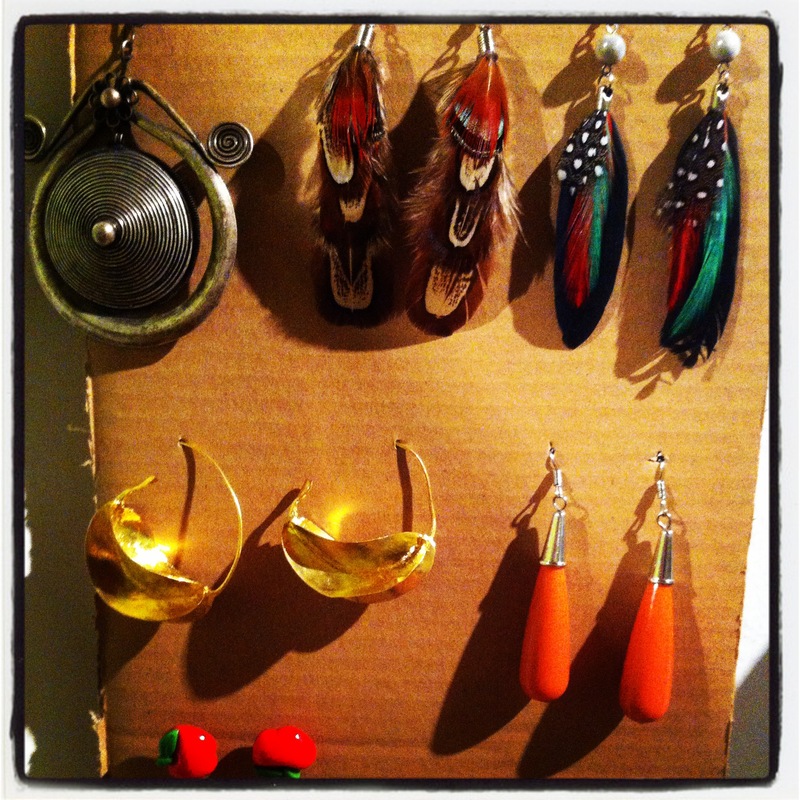 So here’s my tutorial for a super easy, cost effective and environment friendly portable jewellery display. Start by deciding what items you want to display, and how big you’d like your display to be. 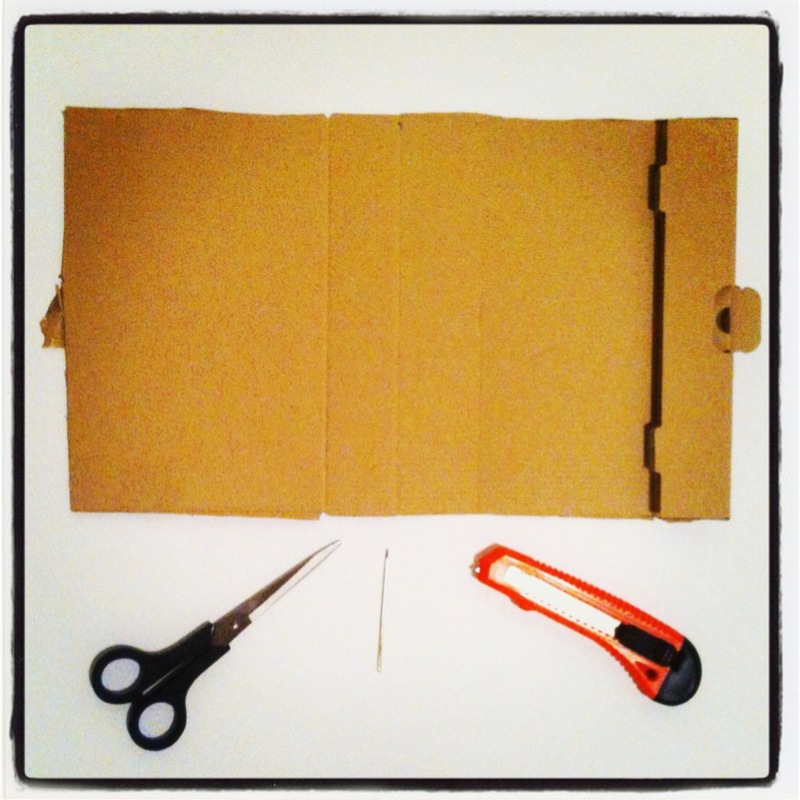 Cut your cardboard to the desired size using the scissors (I used the knife, but scissors are a bit neater. The knife will leave your edges slighty rough). Next, decide what you want to hang where. 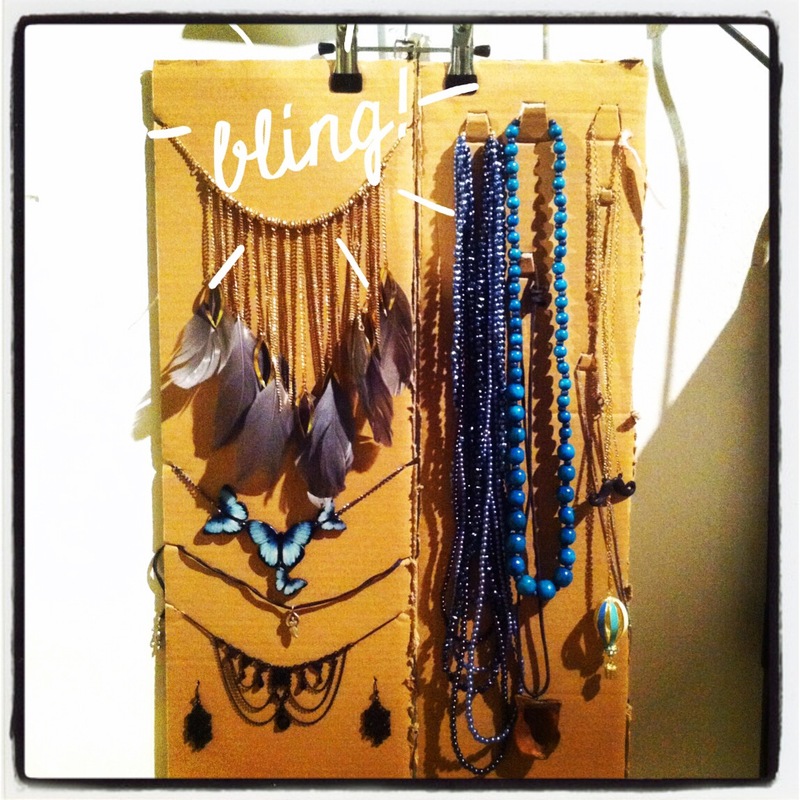 Earrings take up the least space, short necklaces can be displayed beneath each other, long ones lined up next to each other. 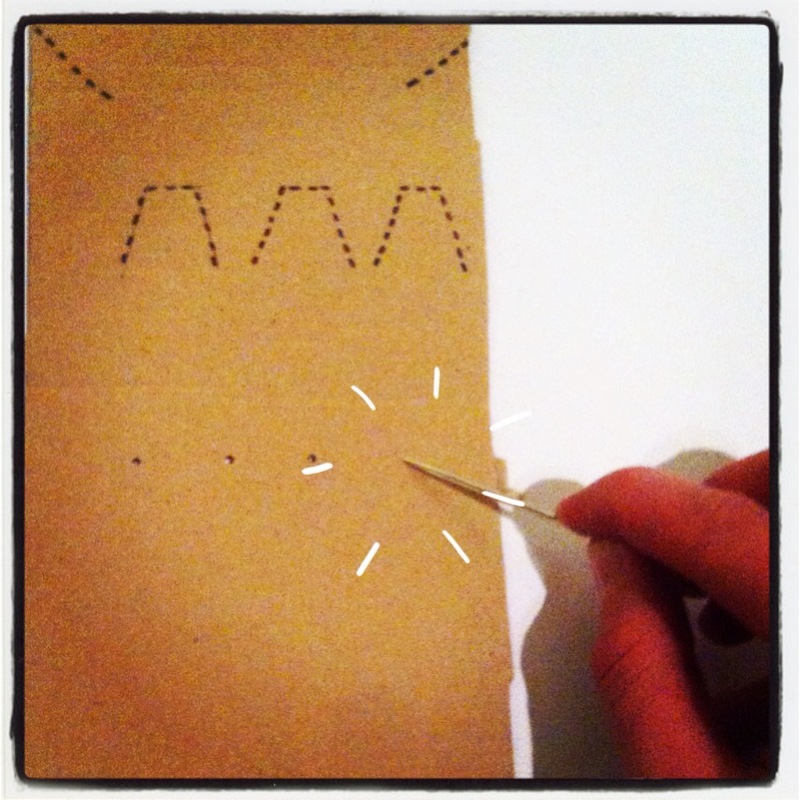 To hang your earrings, simply punch a hole for each earring through the cardboard with your darning needle. Make sure to leave some space between the holes so your dangly earrings don’t get tangled. For shorter necklaces, use your knife to diagonally make one cut into each side of your cardboard like shown in the photo below. For really long or bulky necklaces, cut out an upside down ‘U’. 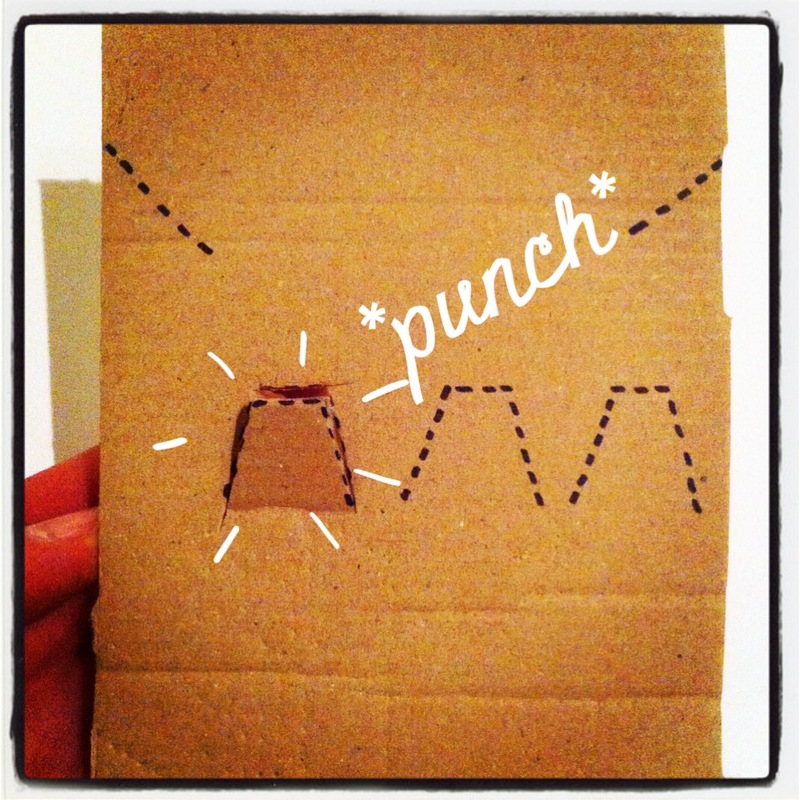 Punch the ‘U’ from the back of the cardboard so it stands out a little bit. Use the ‘U’ like a hook to hang up your necklace. This method also works well for bracelets. 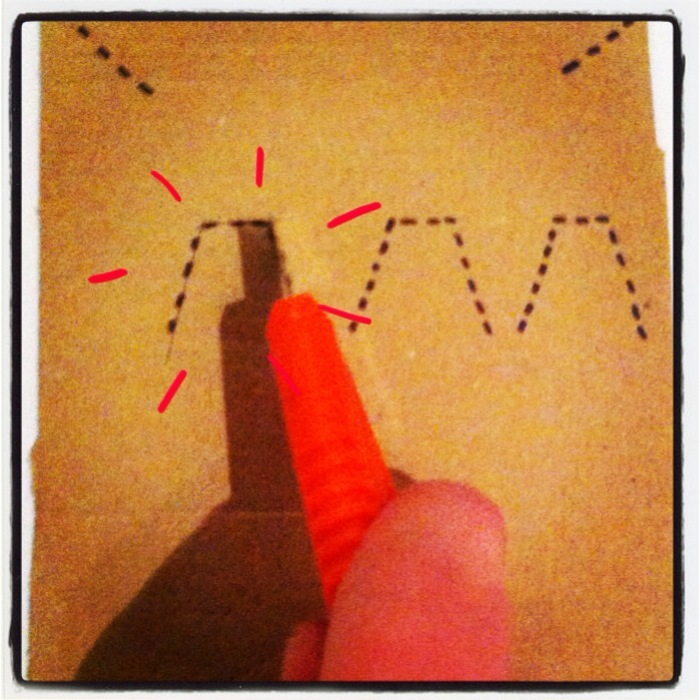 Before you hang up all your things, you could also use pens, markers or paint to draw on your cardboard. Once you’re satisfied with how your display looks, decide how you want to hang it. I used metal scarf hangers as their grip is quite firm and they will hold a lot of weight. I can simply hang them onto the ends of the clothes racks and people will be able to see all the pretty things without having to dig through a box of tangled chains. You could of course also just lean them against something, or tie some string through two holes at the top and hang them on a wall. Or use a skirt hanger and hang inside your wardrobe for neat jewellery storage. 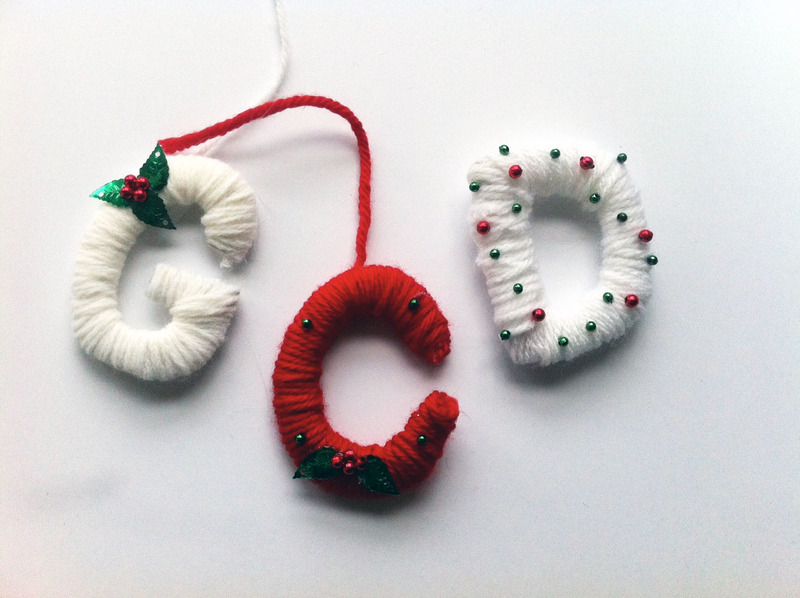 I recently saw Anthropologie’s cute Pop Dot Monogram Decorations, and immediately decided that yarn letters would be perfect as gift tags for my Christmas presents this year. Almost all of my presents are handmade, so of course the tags would have to be handmade too. I have lots of odd bits of wool and glittery things lying around, and these letters are perfect to use those last scraps up. These letter tags are quick to make, the materials cost next to nothing and they look cute both as gift tags and as decorations on your Christmas tree! I made a whole set of MERRY CHRISTMAS letters which I’m giving away as a gift this year. And of course you could change the theme to go with any occasion, birthdays, holidays.. you name it! First, decide how big you want your letters to be. 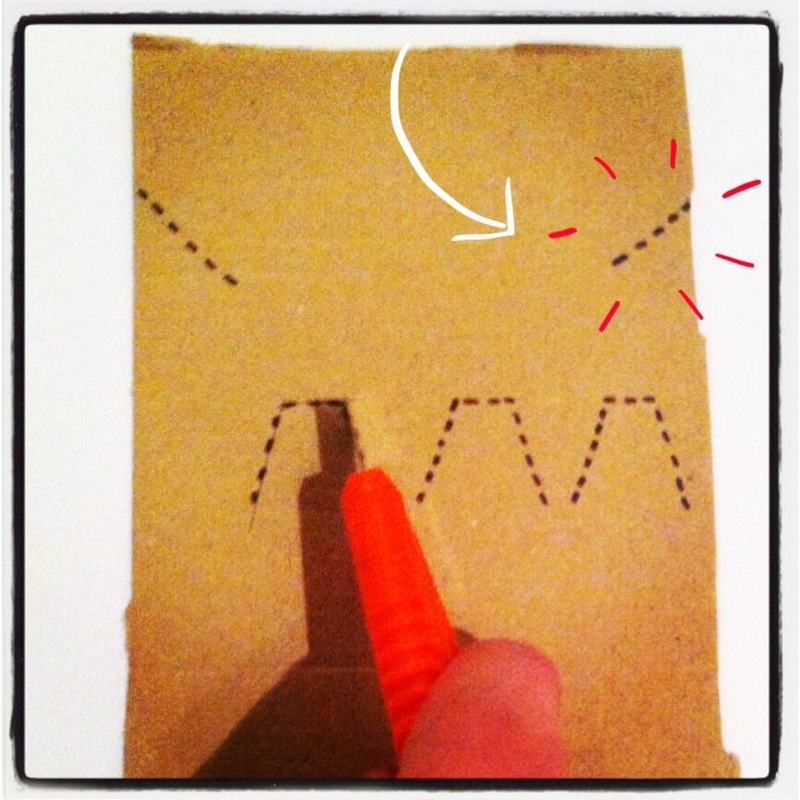 You can either draw them freely, or print templates and glue them to your cardboard. I made my letters about 7cms tall. Cut all letters out neatly trying not to bend the cardboard too much. Choose your yarn colours. 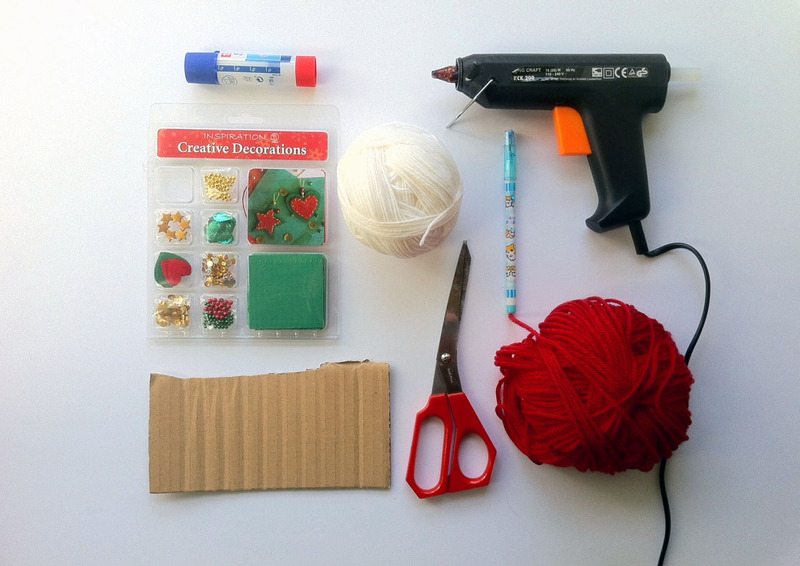 Start by glueing the end of your strand of yarn to the cardboard with the hot glue gun and let it dry. 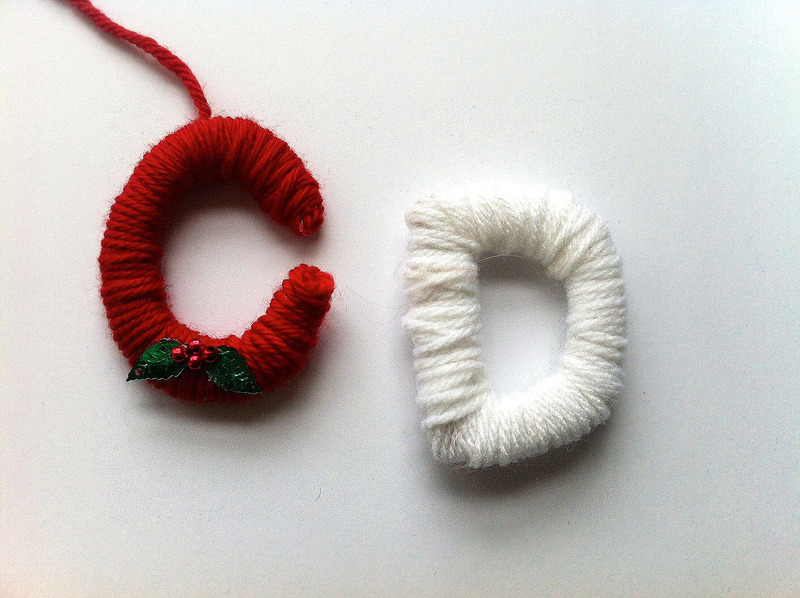 Wrap a thin layer of yarn around the whole letter. If you have trouble keeping the yarn in place, use a little bit of hot glue to fix single strands. Don’t worry about the glue peeking through, you can hide the glue under the next layer of yarn. I used hot glue for sharp angles and to stop the yarn from sliding off the edges of my letters. Tiny amounts of glue will do so don’t go overboard. 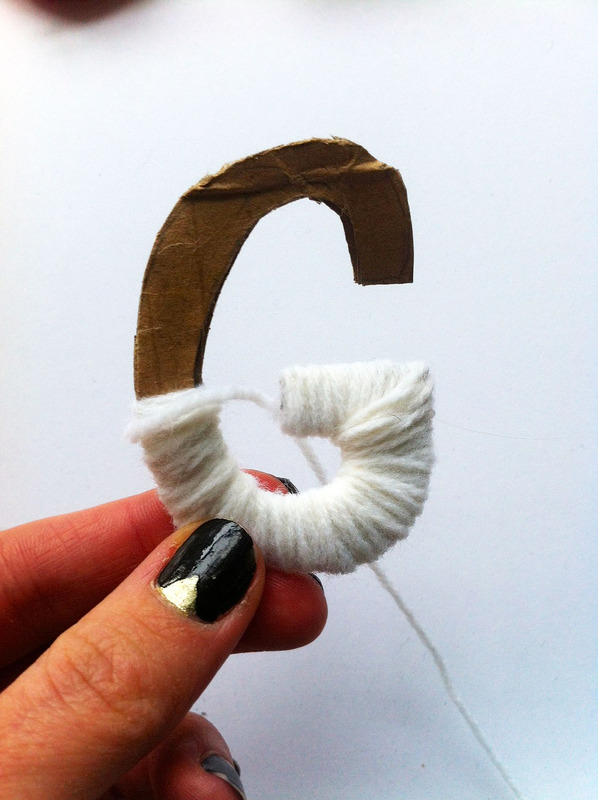 You can even out any wonky lines in your letter by simply wrapping more or less yarn around the cardboard. 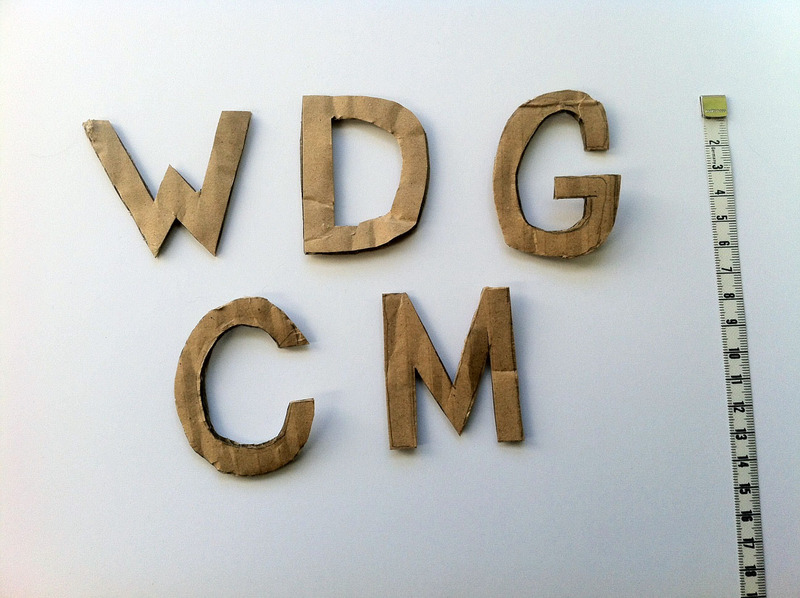 Letters with holes (A’s, D’s, etc) can be tricky to wrap if they are too small. It helps winding your wool into a tiny ball that will fit through the holes, or cut a long piece of string, thread it through a sewer’s needle and use that to wrap your letter. 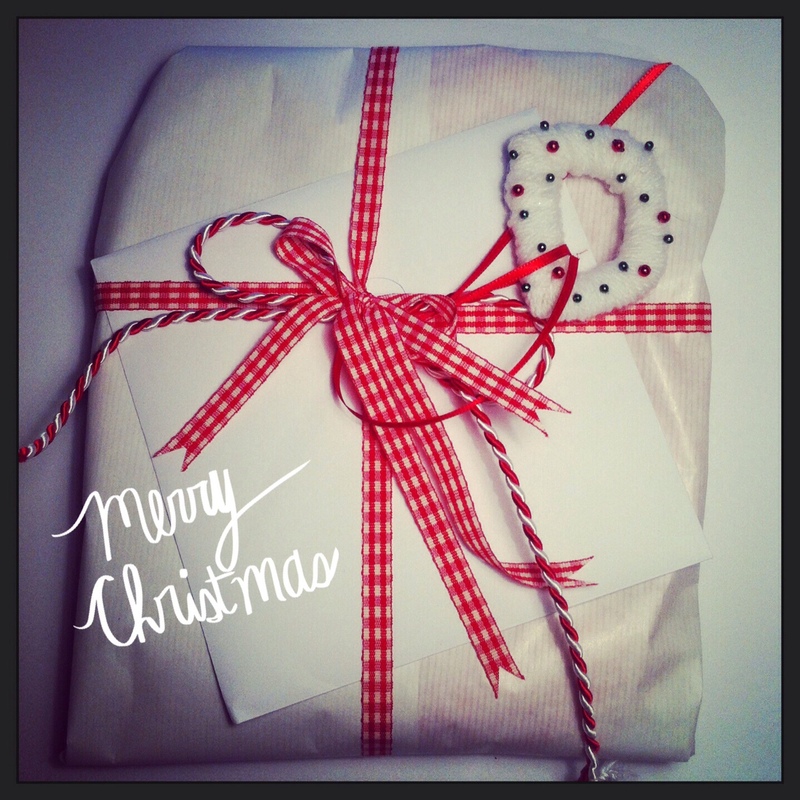 When you have finished wrapping your letters, pick up your glue gun and your decorations and get creative! I love wool. All knitters do (or so I assume) and I am no exception. I find it exceptionally hard to walk past a yarn shop without entering. Usually I leave with at least 2 balls of yarn, already visualizing future projects and possible recipients of my work. And while inspiration is great, sometimes I get carried away. Last winter (it was during the sales though, it was TOO good an opportunity to miss) I bought 15 balls of Rowan Silk Twist, planning to make a jumper or an oversized cardigan for myself. I chose a beautiful gold and ochre shade and couldn’t wait to get home to get started. Once back however another project caught my attention, and another yarn, and all too quickly I was busy making more Kamis and socks and the beautiful bag of yarn lay forgotten in my stash chest. It is now a year later, and winter is almost over again. The yarn is still patiently lying in its bag, waiting for the day when I will finally run out of other projects. Frustrated that I simply don’t have the time and energy to work on a gazillion projects at once, I have set myself a task: Not to buy new wool this year before my stash at home has been reduced to odd bits and bobs. But what to do when you’re busy knitting a piece and all of a sudden you run out of wool? And you’ve decided not to allow yourself to buy another ball of the yarn needed to finish? You frantically rummage around in your stash to find a yarn that works as a substitute. The results are something like these. 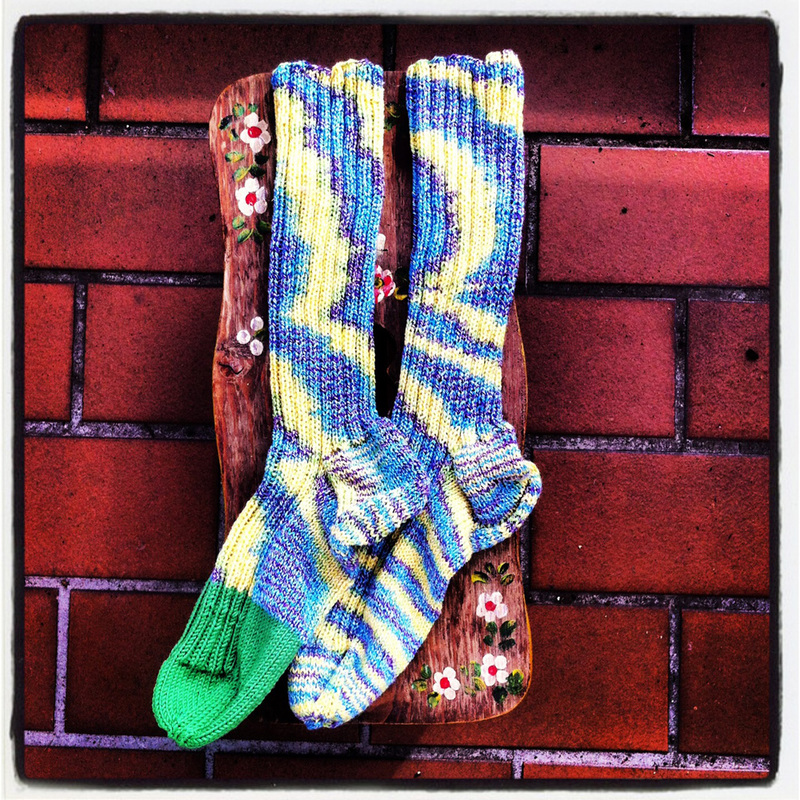 You may ask: But why didn’t she simply knit two green cuffs and finish each sock in the other yarn? The answer is: Because I was wrong. I thought I had enough wool to finish a whole pair, but I didn’t. I kind of like the idea of emphasizing a flaw in a piece though. The Japanese fill cracks in ceramics with pure gold to better show the flaw in a piece, and to honour that even something that is imperfect has its very own beauty. The bold green stands in stark contrast to the rest of the colours, and that was exactly what I wanted. I have a feeling that this kind of look will be a thing throughout the year for me. Can’t wait to see how other pieces turn out. I would love to hear about your favourite projects to recycle leftover yarn!